It's not Evo IV. It's Evo II, which was a lot in motion between 2000-2005, especially at the time when Steve had Evo's crack being fixed. You can distinct Evo II from others by a black pickup selector tip. Watch The Animal from Live at the Astoria and you will know what I am talking about. 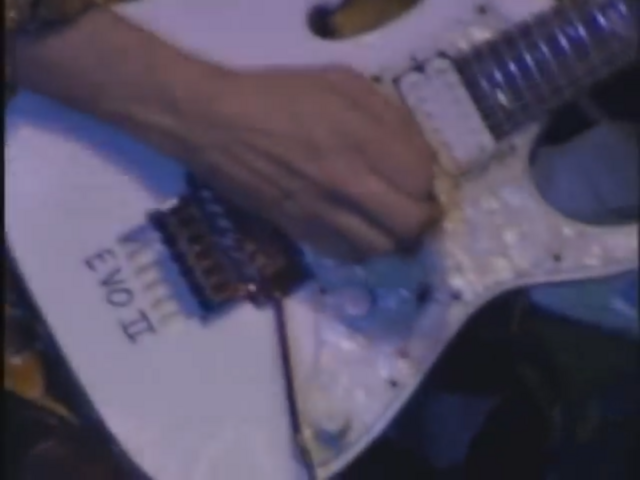 so Yngwie has two of Steve's guitars, BFG and Evo IV? Where's Evo III? Hey Jeroen! So, as far as I can remember, Evo II came in use in late 90's (Fire Garden tour and onwards) and was given to Steve's studio tech/engineer (Charlie Bolis) as it was stated on All About Evo minisite. This means Evo II was not in Steve's posession anymore as of 2003. Then came Evo III, which I cannot find any photo of. Do you have some to share here? I guess this one was a backup for Evo from 2003-2006? At this point, I also want to ask you if Yngwie has two Jems, as I have mentioned before. I've watched his studio tour videos, but he only appears to have one Jem (or has another safely stored), the BFG - big fret guitar. As I look through photos of Steve's guitars and focusing on the color of the pickguard, Evo IV looks to me as if it was built at the time Flo III was. I know I am too picky and caring about not that important things, but I really want to make this thread useful and worthy with all the info about Evo's "substitutes" and a to make a nice place (reading material) for all the people up here. I already was asking about the same thing years ago, but no answer has come to life. I know Evo has it's own story, but her backups do too! Video of Yngwie showing his guitars - including BFG Jem. And Evo II, after it's hardware got changed from gold to cosmo black (actually it wasn't, Evo II is Gold and Evo III and IV are Cosmo Black) Look at Thomas with Evo in the background of the second photo! EDIT: I was wrong, this actually is Evo III! Attached below is also a snap of Evo II during The Animal from Astoria. The name of the guitar is written completely different. They all have a story, but for many of these backup guitars, the story isn't just that well documented - if at all, so I'd have to rely on whatever tiny bits of info I can find and circumstantial evidence. It's very well possible that Evo III and BFG are the same axe, I don't know, I don't have any reference at all to BFG (and not that much on Evo III either). I could ask Steve but the change he'd know/remember is beyond slim.